This protocol was developed in Brussels in December 2000, after a continuing cohort of 85 patients operated in 20 months, of whom 75 underwent an interrupted suture tied extracorporeally for the very first, then intracorporeally according to the Montsouris technique, and 10 patients had a running suture for the anastomosis. 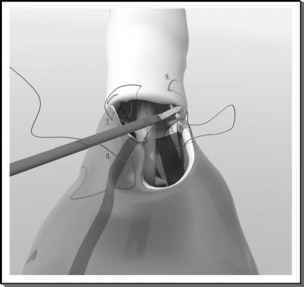 Since 2000, about 265 consecutive patients have been treated with this modified running suture consisting of one single intracorporeal knot (9-11). FIGURE8 ■ The "single knot" running suture technique (all stitches are labeled according to Table 2). The running stitch is initiated by placing both needles (SH or UR-5) outside in through the bladder neck and inside out on the urethra, one at 5:30 position and the other needle at 6:30. FIGURE9 ■ The "single knot" running suture technique (all stitches are labeled according to Table 2). The sutures are run from the 6:30 and 5:30 positions to the 9 and 3 o'clock positions, respectively, approximating the bladder and urethra at each pass. The posterior lip of the bladder neck is left apart from the posterior urethra as long as the two first runs on the urethra and the three first runs on the bladder are not completed. FIGURE 10 ■ The "single knot" running suture technique (all stitches are labeled according to Table 2). As such, going on this way, both knots might reside on the bladder side of the anastomosis, this is avoided between sutures 7 and 8 to end on the urethral side with the right thread and on the bladder side with the left one. FIGURE 11 ■ The "single knot" running suture technique (all stitches are labeled according to Table 2). Carrying the suturing up to the 12 o'clock position on both sides, going outside in on the urethra and inside out on the bladder completes the remaining closure. FIGURE 12 ■ The "single knot" running suture technique (all stitches are labeled according to Table 2). At 12 o'clock, the ends of the running sutures are tied to one another, intracorporeally, on the outside of the bladder. Abbreviations: UR, urethra; BN, bladder neck; Rh, right hand; Lh, left hand; Bh, backhand; Fh, forehand. Source: From Refs.9-11. sequence of all sutures are described in Table 2. This table also illustrates the reduced need to sew with the left or nondominant hand although ambidextrous skills remain useful to some extent. 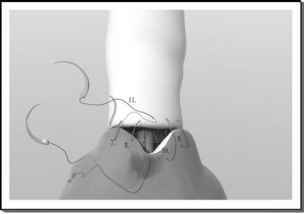 If some discrepancy persists between the diameters of the urethra and of the bladder neck, some residual anterior opening of the bladder is closed at that moment in two layers with the same sutures; in that case, both lengths of threads are increased accordingly to about 20 cm. 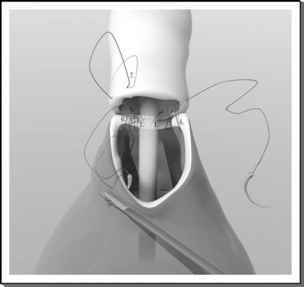 The balloon on the 20-French silastic catheter is filled with 10 cc of water; the bladder is irrigated until clear with approximately 60 cc of sterile water. 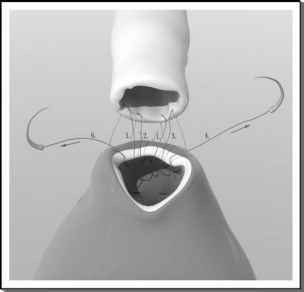 A drain is placed and is usually removed on the first postoperative day. The catheter is normally left in place for five to six days, and removed after a retrograde cystogram. One of the major advantages of laparoscopic radical prostatectomy is its potential to perform all the sutures under total visual control. 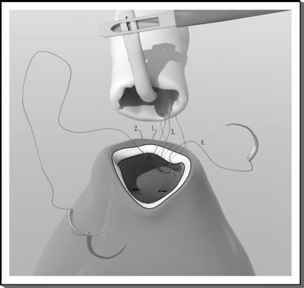 However, knotting of the sutures is time consuming and contributes to prolonged operating time (1). In open surgery, in fact, a half-knot necessitates less than two seconds, whereas the same requires 15 to 20 seconds during laparoscopy.